Drip systems are a water-conserving alternative to sprinkler irrigation. By delivering a precise quantity of the water to the root zone at the base of each plant, no water is wasted to evaporation and the varying water needs of the different species contained in the garden are provided for. In a drip system, a network of hoses and tubing distributes water to drip emitters located around each plant and a battery-powered timer controls the timing and duration of the each watering cycle. Drip irrigation has a wide range of applications, but a common sequence of steps is used for each of these. Once you familiarize yourself with the basic components, installation is an intuitive process and modifications are easy to make as conditions change. 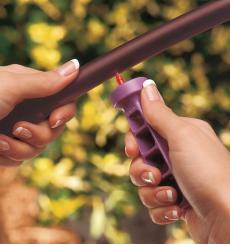 Insert batteries into the irrigation timer and thread it onto an outdoor hose faucet. Thread an anti-siphon valve onto the outlet of the irrigation timer. Thread a drip irrigation filter onto the outlet of the anti-siphon valve. Thread a pressure reducer onto the outlet of the drip filter. Thread a hose-to-drip adapter onto the outlet of the filter. Push one end of a roll of 1/2-inch drip hose about 1 inch deep into the outlet of the hose-to-drip adapter. Wiggling the hose back forth as you push it helps it to go into the fitting. Uncoil the hose through the area that will be irrigated by the drip system. 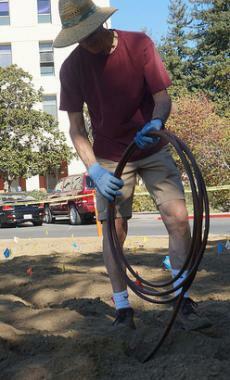 Secure the hose to the ground with irrigation stakes every 4 or 5 feet. Try to run the hose by the base of as many of the plants as possible. In areas with numerous small plants, it's fine to run the hose through the general area. Once the hose has been spread throughout the area to be irrigated, cut off the remaining portion of hose with a utility knife. Measure the distance from the 1/2-inch hose to the base of any plants that it does not pass directly and cut a piece of 1/4-inch tubing to the appropriate length for each one. Make a hole with a drip punch tool into the 1/2-inch hose at the point closest to each plant that it does not pass directly. Push one end of a barbed connector into each hole until it snaps into place. Push one end of the corresponding piece of 1/2-inch tubing onto the other end of each of the barbed adapters, wiggling it as you push, until it covers the entire end of the adapter. Repeat the process for all the other plants. Install emitters for each plant. Where the 1/2-inch hose passes by a plant directly, use the punch tool to make a hole in the hose adjacent to the plant and push the barbed end of an emitter into each one. The emitters will snap into place when they are fully inserted. For the plants supplied by 1/4-inch tubing, push the barbed end of an emitter into the open end of the tubing. Secure the tubing to the ground with a metal stake so the emitter is held adjacent to the stem of each plant. 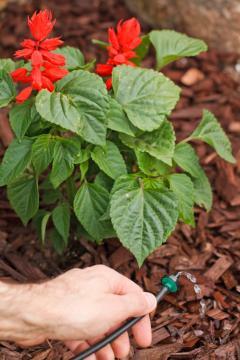 Open the hose faucet and press the manual button on the irrigation timer to run water through the system. Watch the open end of the 1/2-inch hose and turn off the water once all the dirt and debris has been flushed from the system and the water runs clear. Push a 1/2-inch end cap onto the open end of the 1/2-inch hose. Program the timer according to the water needs of the plants and leave the faucet open, so the water will run through the system when it is activated by the timer. Cover the drip tubing with mulch to conceal it, but avoid burying it underground. Drip emitters are calibrated to release water at varying rates, allowing plants with different water needs to be irrigated in a single system. As a general rule, use 1/2 gallon per hour (gph) emitters for perennial plants, 1 gph emitters for shrubs and 2 gph emitters for trees. One emitter per plant is sufficient when they are newly planted. As they grow, however, add additional emitters throughout the area covered by each plant. Most perennials will never need more than 2 or 3 emitters, but a large tree could eventually need 20 or more emitters. Space the emitters 12 to 24 inches apart as they are added, depending on the size of the plant. When a lot of emitters are needed in a small space, it's easier to use tubing or hose that has them built in. This is especially helpful for irrigating annual flowers and vegetables. Water output and emitter spacing varies; choose based on the spacing and water needs of the planting. Micro-sprayers are an option for irrigating groundcover plantings with a drip system. These plug into the 1/2-inch hose using barbed adapters and are adjustable for spray distance and spray radius. Most products have a spray radius of less than 10 feet, so space them accordingly to ensure complete coverage of the planting area. There are numerous fittings, couplers and adapters that help drip systems to adapt to a wide variety of settings. The most important of these are straight couplers, elbows and "T"s, all of which are available for 1/4-inch tubing and 1/2-inch drip hose. Straight couplers splice together two pieces of hose or tubing to extend it where needed. 90 degree elbows are useful where a tight turn is needed, such as around the corner of a wooden or concrete border. "T" fittings allow side branches of hose or tubing to be installed from the mainline to reach outlying plants. Keep in mind that drip irrigation products vary among manufacturers, so always follow the instructions provided. Rather than purchasing all the components separately, a drip irrigation kit is a good way to start, as the parts are guaranteed to be compatible. If an individual emitter is not emitting water, it is probably clogged and must be replaced. Also, check the drip filter. If it appears dirty, rinse it under a strong stream of water to remove the particles of sand and soil that naturally accumulate. Clean the filter at the beginning of the season and check it monthly to keep the system in good working order. If none of the emitters are emitting water, first confirm that the water supply has not ben shut off. Otherwise, there is probably a malfunction in the irrigation timer. Make sure that the batteries are good and refer to the owner's manual for troubleshooting. Many models have a reset feature that comes in handy if the internal computer malfunctions. If water is observed spraying from the side of a piece of hose or tubing, it was probably cut accidentally while working in the garden. Rodents have also been know to chew holes in drip lines. Plugs are available for small holes, but if it goes all the way through, use a straight coupler to splice the two pieces back together. If water distribution is uneven among drip emitters of the same output, they may need to be replaced with pressure-compensating emitters. These are necessary on drip systems that have more than a slight change in elevation. If only the emitters at the end of the line have reduced flow, the maximum number of emitters has been exceeded. Most drip systems cannot accommodate more than 220 gph on a single line. It is difficult to remove drip hose from the fittings by just pulling it. Use a pair of needle nose pliers to pinch the hose inside the opening of the fitting to remove it. Installing and using a drip irrigation system will help you keep your lawn and garden healthy, while using less water than a traditional sprinkler system. With a bit of skill and manual labor, you can install your own system fairly quickly and easily.